Pramodita Sharma (PS): What was the original idea behind the model? Has it been misused? John Davis (JD): Well, remember that this framework came out very early in our interviewing of people who worked in family businesses. Most of them were family business leaders, many were founders, a few were later generation family member-employees. We needed a conceptual “place to put people” we were interviewing. We wanted to understand individuals’ viewpoints, their roles, their confusion about some topics, why certain decisions were difficult for them, and why they were dwelling on certain issues. Ultimately, we were trying to understand why individuals in these businesses (we didn’t call it a system yet) saw the world the way they did and what issues were important to them. The need to organize the information we were gathering and what we were learning led us to the three circles: the business, obviously; the family, naturally; but then, eventually, also the ownership group. Without accounting for the ownership group and perspective, we couldn’t bucket all the comments and data adequately. But with three circles, we could organize the information we were gathering and we thought, wow, the three-circle framework seems to be enough. And it started as a framework. Frameworks are largely for bucketing information. Later, we saw that the three circles and the interaction of the three circles had great explanatory power, and we called it a model. A comprehensive, predictive theory of action and reaction in the family business system hasn’t been accomplished, and maybe won’t be developed given the many intervening variables that can affect the outcomes of certain changes in any circle. The original intent of the three-circle model was to locate individuals in the system, identify their various interests, and observe how individual and group interests and behaviors interacted. The three circles can also indicate thematically, for example, that the goals of the three groups can overlap and still be distinct. The clarity and simplicity of the model allowed people in the field to explore many topics. It has guided our thinking in this field in fundamental ways. That’s all we needed in the beginning, and it has held up well, I would say. When you build a framework or a model, you hope it helps you understand a lot, but soon enough you see that it doesn’t do everything. Advisers don’t have a clear place in the model. Governance structures, for example, with their adviser members, don’t fit perfectly in the geometry of the three circles. That said, non-purists can still add a board of director’s symbol in the overlap of business and ownership groups, and readers can see where it belongs in terms of its responsibilities. As for examples of misuse, I can’t go that far. Some people thought highly enough of the three-circle model that in the early days they claimed it as their invention. But that’s different than misuse. Some have found the original three-circle model frustrating because it doesn’t do what they want it to do—like have clear categories for advisers or governance groups. I would add that the three-circle model doesn’t adequately diagram the situation of a multi-family business. But attempts to build a substitute model, with the necessary complexity to account for other memberships, haven’t been received well because they are either conceptually flawed or very complex and hard to use. I haven’t seen a workable (clear and relatively uncomplicated) four-circle model although it’s been tried. I wouldn’t call these a misuse of the model, but it’s not how we initially thought of it. Sometimes to make a point, people will move the circles around, separate a couple of the circles, make circles of different size, etc. That’s a different use of three circles and it’s fine if it gets you someplace in your thinking and explanations. In general, I think people have used the model in ways that have been useful. PS: Can you share the spirit of the conversations and thought processes you went through when this model was created? What was it like working with Ron Taguiri? JD: Well, I was a doctoral student at the time and Renato Tagiuri, who was an extraordinary conceptualizer and a wonderful mentor, would send me to do interviews with his executive students who worked in family companies. I’d ask the subjects very basic questions, listen, record, and make notes on what I was hearing (I still have tape recordings of a lot of these interviews, by the way). Sometime later, who knows how long at this point, but it was after working with those three circles, reviewing stories, putting little stick figures of people inside the three circles, drawing arrows between them, and adding little labels next to them, that we realized we didn’t need another circle. It became clear that there were three overlapping systems that interacted and influenced parts of this super system. And that allowed us to see that after a couple of generations, the three circles changed. The families were larger, the ownership system is larger, the business is bigger, but the three circles still work. So, we kept using it. I think it’s fair to say, we had no idea this model would be so helpful. We wrote a paper explaining the model and its lessons in 1980. It quickly gained acceptance but not by journals. FBR published our article in 1996. PS: Forty years later, what advice and guidance would you have for new advisers entering the field? JD: For openers, if you want to be a good adviser, it takes years of practice, maybe 10,000 hours as Malcolm Gladwell says in Outliers. You get some credit-hours for experience outside this field, say 2,000 hours because you start as a therapist or business strategist and know some things from having been out in the world, and you know good process. But get comfortable with learning and growing intellectually into this field. That reflects my view that the best advisers are very curious individuals, like detectives, and problem solvers. They like thinking about the why’s and how’s in these systems—why did this situation happen and how could it become a stronger, healthier system. They don’t simply see themselves as purveyors of a product or technique: you need a family constitution because all families do, and I can help you write it. Without curiosity about the system, I don’t think you can be great at this practice, at this profession. I think you can be good for some situations, but I don’t think you can be great. A good adviser also earnestly wants to help his or her client. A good adviser respects himself or herself and charges a fair price for the work but wants to help the client. Advisory work, in the way we do it, isn’t a transaction, it’s a collaborative process. I am an academic who has spent most of my life enquiring about, and trying to help, families and family enterprises. I started out asking simple questions and then, over time, asking better questions. My curiosity and drive to be useful has led me to insist on conceptual clarity and rigor. My curiosity and my desire to help others are at the root of what I do. So, the desire to help others and the curiosity to be a good problem solver are what I would encourage. This is such a fascinating area, not only for the intellectual satisfaction of solving a complicated problem or figuring out why something works the way it works, but also for the satisfaction of helping people. Where else do you find that? Forty years later, I’m still loving it. 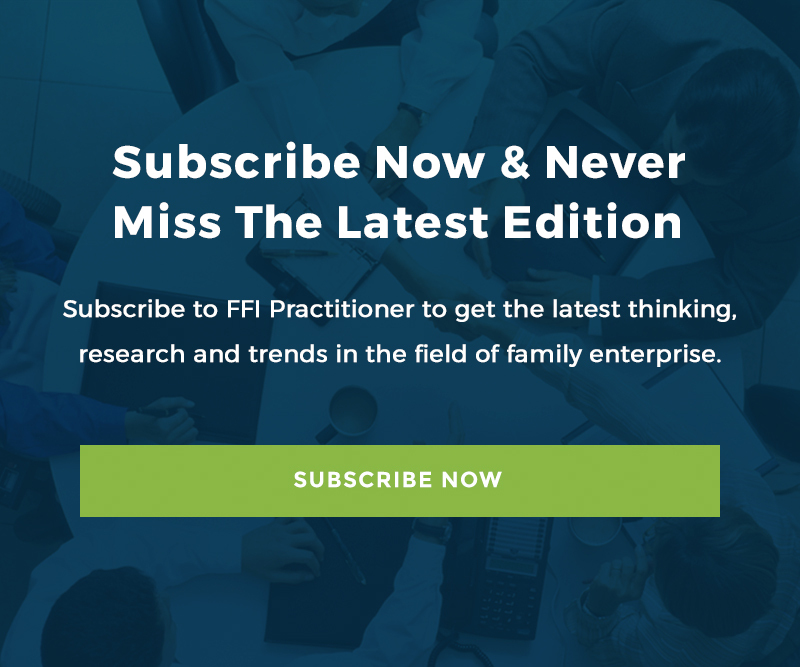 Professor John A. Davis, FFI Fellow, is a pioneer in the family enterprise field and a globally recognized authority on family enterprise, family wealth and family office topics. He has created some of the most impactful concepts and frameworks used in the field. In 2018, he joined the MIT Sloan School of Management faculty to build an innovative portfolio of family enterprise programs, after leading the family enterprise area at Harvard Business School for more than 20 years. He is also the founder and chairman of Cambridge Family Enterprise Group, where he advises some of world’s leading enterprising families. He is the recipient of the 2016 Richard Beckhard Practice Award. He can be reached at [email protected]. Pramodita Sharma, FFI Fellow, is a professor and Daniel Clark Sanders Chair in Entrepreneurship & Family Business at the Grossman School of Business, University of Vermont. She is a visiting Professor at the Kellogg School of Management’s Center for Family Enterprises, Northwestern University. From 2008-2017 she served as the editor of the Family Business Review and in 2013 launched the Global Family Enterprise Case Competition. She is the recipient of the 2011 Barbara Hollander Award. She can be reached at [email protected]. Professor Renato Tagiuri was the co-creator of the three-circle model. A faculty member at Harvard University for over 30 years, Tagiuri was an influential scholar in the areas of interpersonal relations, the human aspects of management, and a pioneer in the family business field. He advised a number of business families in his long career and was chairman of the Cambridge Family Enterprise Group, 1989-2008. He is the recipient of the 2004 Richard Beckhard Practice Award. He died at the age of 91 in 2011.